UGC NET Eligibility Criteria 2019 – UGC-NET Eligibility Criteria 2019 is set and finalized by the National Testing Agency (NTA). The NTA conducts the University Grants Commission – National Eligibility Test on the behalf of University Grants Commission to determine the eligibility for Assistant Professor and Junior Research Fellowship (JRF) in Indian Universities and Colleges. Candidates should carefully go through the UGC-NET Eligibility Criteria 2019 to check if they are eligible for this exam. Applications from candidates who do not fulfill all the requirements will be summarily rejected. To know more about UGC-NET Eligibility Criteria 2019, aspiring candidates may keep reading. A candidate applying for UGC NET JRF cannot be more than 30 years (as on July 01, 2019) however there is no such specification for UGC NET Assistant Professor. Postgraduate students with an overall average score of 55% marks can apply for UGC-NET 2019. Reserved categories will be provided with relaxation in terms of both age and educational qualification. The UGC NET examination is a tough examination to crack. However, tougher than qualifying the exam is being eligible to apply first. The NTA which is responsible for conducting the NET exam has set strict clauses in the Eligibility Criteria, which has to be fulfilled by all the NET aspirants. 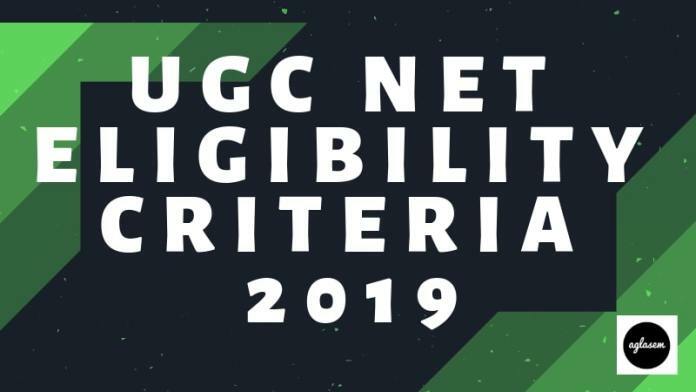 All the requirements of UGC NET Eligibility Criteria 2019 have been detailed in the next sections. Educational Qualification Eligibility: The chief requirement of this section is that the candidate seeking to apply for NET is a postgraduate student or is awaiting their final result and degree certificate, or is in their final year/semester of their postgraduate degree course. Candidates must have secured at least 55% marks (without rounding off) in Master’s Degree or Equivalent degree from Universities/Institutions recognized by UGC, in Humanities (including languages) and Social Science, Computer Science and Applications, Electronic Science etc. will be eligible for UGC NET 2019. Candidates who are pursuing their Postgraduate degree or equivalent course OR candidates who have appeared in their qualifying Master’s Degree examination (for Final Year / Semester) and are waiting for their result/degree OR candidates whose qualifying exams have been delayed may also apply for this test. However, such candidates will be admitted provisionally and shall be considered eligible for the award of JRF/eligibility for Assistant Professor only after they have passed their Master’s Degree or equivalent examination with 55% marks. Reserved categories: Candidates belonging to Scheduled Caste (SC) / Scheduled Tribe (ST) / OBC-Non Creamy Layer / Person with Disabilities (PwD) categories will be provided with a relaxation of 5% marks in required percentage obtained in qualifying examination of their master’s degree. Further, senior candidates with a PhD, who completed their postgraduation by the year 1991 are also eligible for availing of 5% relaxation in percentage obtained in their qualifying examination. SC/ST/OBC/PwD will need a minimum of 50% marks in their Qualifying exam to apply for UGC NET 2019. PhD holders whose completed their Post Graduation course by September 19, 1991, will need a minimum of 50% marks in their Qualifying exam to apply for UGC NET 2019. Age Limit: There is an upper age limit for applying for the Junior Research Fellowship through UGC NET 2019, i.e the candidate cannot be more than 30 years of age (to be calculated as on December 01, 2019). However, there are no Age Limit restrictions for applying for Assistant Professor. SC/ST/OBC(Non-Creamy Layer)/PwD/Transgender/Women candidates will be provided age relaxation up to 5 years. Age relaxation will be provided to candidates having research experience in the relevant/related subject of post-graduation degree. This relaxation will depend on the period of time spent on research, subject to a maximum of 5 years. Candidates possessing an LL.M degree will be eligible for availing an age limit relaxation of 3 years. Candidates who have served in the Armed Forces will be eligible for availing age relaxation up to 5 years, subject to the length of time served in the Armed Forces. Note: Maximum age limit relaxation to be provided to any of the above-mentioned categories cannot exceed 5 years under any circumstances. From below candidates can check the Exemption for Eligibility for Assistant Professor. Even though NET/SET/SLET shall remain the minimum eligibility condition for recruitment and appointment of Assistant Professors in Universities/Colleges/Institutions recognized by UGC, an exemption is sometimes made in the case of candidates who have not qualified the UGC-NET/SET/SLET. However, this exemption will be governed as per UGC regulations and amendments as notified in the Gazette of India from time to time. Candidates who passed UGC/CSIR JRF examination prior to 1989 will also be exempted from appearing in the NET exam. Candidates who have cleared the States Eligibility Test (SET) accredited by UGC for Assistant Professor held prior to June 01, 2002, will be exempted from appearing in NET, and are eligible to apply for Assistant Professor anywhere in India. For all SET exams held after June 01, 2002, qualifying candidates will be eligible to apply for the post of Assistant Professor only in the Universities/Colleges situated in the State from where they have cleared their SET. All candidates seeking to further their careers as a Professor/Assistant Professor in Indian Universities and Colleges have to qualify the UGC NET examination. It is an exam where only candidates with a postgraduate degree can participate. To be eligible to appear for NET, applying candidates who do not possess a postgraduate degree yet, have to keep in mind the minimum requirement is 55% aggregate marks in their qualifying Master’s Degree examination, as upon failing to produce the requirement of the 55% score in the qualifying exam within 2 years of qualifying the NET exam, the NTA will disqualify the NET qualification and the candidate will not be awarded either JRF, and neither will they be appointed as Assistant Professor. Qualifying the UGC NET 2019, a candidate becomes eligible to be recruited in any University/College in any state, unlike the State Eligibility Test (SET) that qualifies candidates for a specific state only.